Sometimes, in the world of jewelry, simple is better. 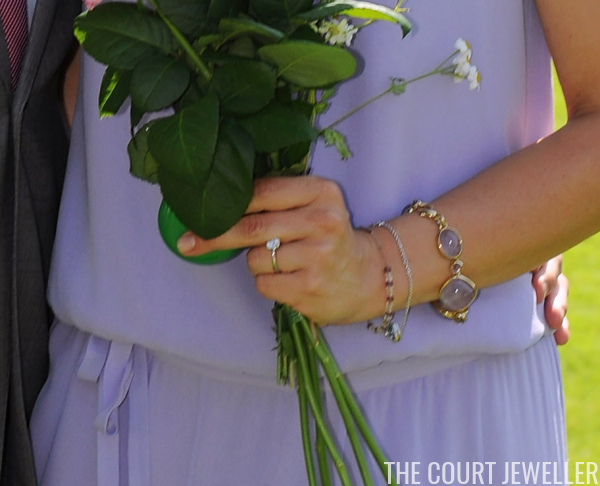 A prime example of this: the engagement ring that belongs to Crown Princess Victoria, the future queen regnant of Sweden. Victoria received the ring from her future husband, Daniel Westling, in 2009. The white-gold ring is set with a round brilliant-cut diamond solitaire. 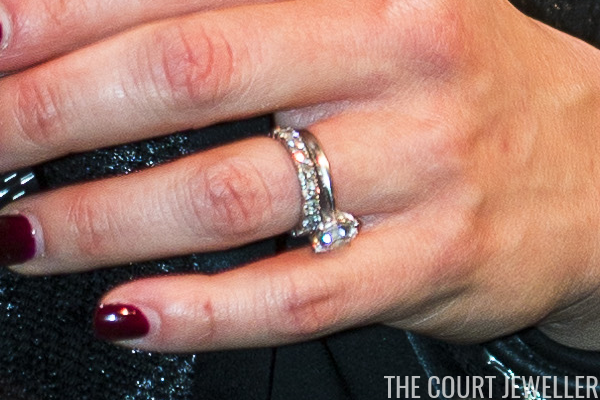 Above, Victoria shows the ring off during the couple's official engagement press conference. 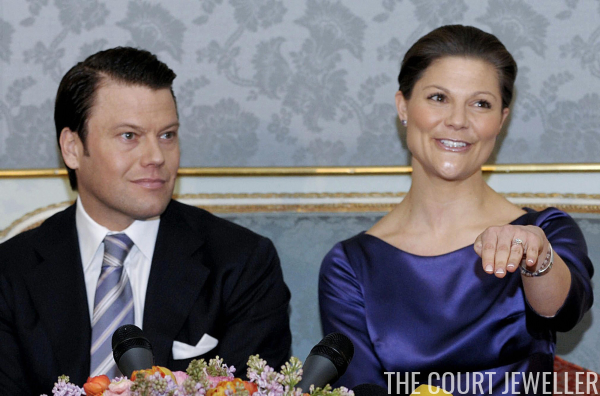 It's said that the ring may be the work of Bolin, official court jewelers of King Carl XVI Gustaf. Daniel's decision to present Victoria with a diamond engagement ring was a break from Swedish tradition. In past generations, royal couples had exchanged simple gold bands to mark their engagements. Even Victoria's father, King Carl XVI Gustaf, has a golden engagement ring. But this time, the Swedes followed the newer Western tradition. 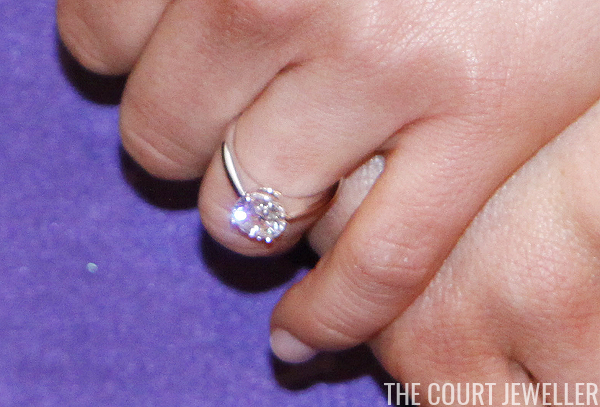 Above, you can see Victoria's ring sparkling on her birthday in 2009, almost exactly a year before her wedding. On their wedding day, Daniel gave Victoria an additional jewel: her wedding band, which is studded with diamonds. She usually wears the two rings together on her left hand. One problem with the simple setting is evident here: the ring tends to slide off to the side of her finger rather than staying centered. 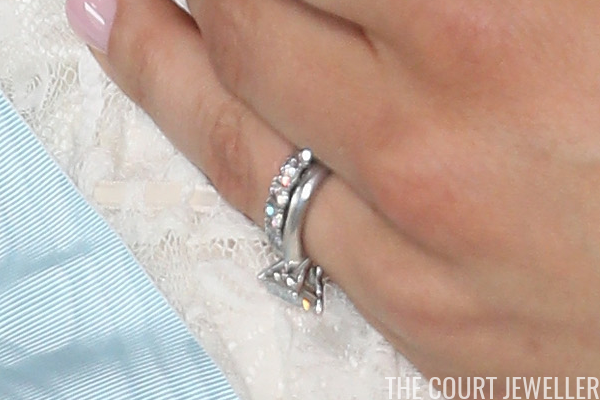 Here's another look at the pair of rings from Prince Oscar's christening. You can see the details of the simple, effective setting from this angle.